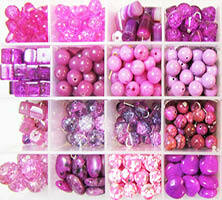 For original jewelry making I buy colorful beads, buttons and charms. Finding pretty and unique beads, buttons, charms, chain and findings for my handmade jewelry designs takes time, but I love getting new jewelry supplies for my drop earring, charm bracelet and chunky necklace designs. Part of the enjoyment of creating earrings, bracelets and necklaces is receiving new bead and button choices for inspiration. The textures and variations in color of my new jewelry components are an expanded pallet of choice. I place all new beads and buttons in containers with other beads and buttons of similar colors and sizes. Being organized doesn’t hold me back in jewelry design, it helps me be creative when I know where everything is and can get it at a moments notice without breaking the momentum. If you know what you have available, it opens up the creative process and you can tick off all the options in your mind. When I’m messy I feel out of sorts and weighed down. It’s also good to be organized in my jewelry studio so I can put everything away fast and start with a clean slate the next day. It helps the creative process if I don’t have my jewelry lying about all the time when I’m not working on it, that’s not a real break. Hollywood Glam Flower Bracelet shown above is a sophisticated bead and button bracelet that brings glamour back to special occasions like weddings, christmas parties, gala events and chic soirees. This Hollywood Glam Flower Bracelets is designed with ornate silver heart buttons and pretty pink flower buttons with purple crackle beads. I use unique jewelry designs everyday to sidestep fashion misadventures. 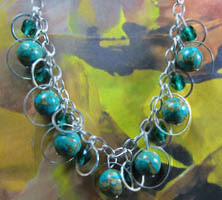 I have handmade original jewelry on hand as a quick fix to bring a problem outfit together. With long drop dangle earrings, chunky beaded bracelets, fun bold pendant style necklaces and the experience I’ve gathered over the years I feel I can take on the world. I’ve made some big fashion mistakes. While finding solutions to my fashion blunders I realized I don’t mind inspiring someone else to laugh or atleast smile, but now I try to inspire humour by putting my fashion ensembles together with colorful accessories in a fun purposeful way. Wear colours or patterns that didn’t really go together, but you really wanted them to? This is a fun fix, wear a beaded charm bracelet that brings it all together. Feel unsure that you're dressed for the occasion? Have a back up plan, carry an extra pair of shimmery long drop dangles with you for special occasions. Not have time to change between work and your hot date? Accessorize with a statement necklace. The necklace will help switch your state of mind from work to play and revives you inside out. Wear something that someone else is wearing too! This could be a nightmare, but by adding jewelry and edgy nail polish that you carry in your purse, you can make a statement. Don’t forget to introduce yourself to your fashion twin, obviously they have great taste and could be a lifelong friend. Feel the weather is cramping your style, because you have to cover up? Go with a chunky style necklace and big earrings and you’ll still stand out with style. Original Purple Glam Necklace shown top left enhances your neckline with eye popping purple and plum buttons in dramatic layered design. This jewelry has bold feminine style and fashion flare. So dare to be different with a creative chic necklace that delights. This pretty fashion accessory is great for fancy soirees and going out with friends. Big Button Fashion Earrings shown above have large yellow buttons hang from smaller trendy teal buttons. Big yet lightweight drop dangles make it simple to add flare to all your outfits. Handmade long colorful earrings are a must have fashion accessory for trendsetting fashion stars. Flirty Charm Earrings shown above on the left have silver pewter butterfly charms hanging over fashion buttons in a unique earring design. Big drop dangles bring out your fun style. Details of the charms are boldly highlighted in front of colorful green buttons. You’ll look fashionably cool in these surprisingly lightweight Flirty Charm Earrings. Original handmade jewelry keeps the focus on you. Show fashion style with bold necklaces, cute bracelets and highlight your features with colorful fun earrings. Use clothing as your starting point and wear unique jewelry pieces to complete the look. When colorful beads, trendy fashion buttons and big bold charms stand out in a striking way they create lingering interest. You need a fun fashion focal point so the eye has something to center on instead of going everywhere and then away from you with no interest. It’s interesting yet comfortable for the viewer to know where to look. People will be transfixed and at ease when your outfit looks complete with jewelry. The great news is jewelry can draw attention to you, but away from areas you feel self conscious about. Bring attention to your neckline with a colorful necklace, emphasis your pretty hands with a cute bracelet then highlight your features with fun drop earrings. The focus is on you, yet areas you have issues with are less noticeable leaving you free to be confidently beautiful. Handmade Big Button Bracelet shown above makes a statement with big buttons and cute floating accent beads. Fashion jewelry designed for a big personality. Your individual style is brought out with this original fun fashion bracelet by combining bright green and teal buttons with green accent beads. This Big Bling Bracelet shown on the right has round buttons with patterns and shimmery textures. The beads vary in size and shape complimenting the buttons in shades of red and dark red. The loops connecting the big buttons make this bracelet shine brighter in motion. Fashionistas love this unique colorful bracelet, because you’re bold and your style is meant to be noticed. You can tell how someone is doing sometimes just by what they are wearing. Do you dress bright and fun, or somber and dark? You can change how you feel just by how you put your outfits together and how you accessorize. Your jewelry can fill in with bold fun color and unique style where your clothes might be lacking. So why not accessorize to make yourself happy and bring more color into your life. Wear fun earrings, colorful bracelets and bold necklaces anytime you feel down. Colored glass beads, semi precious gems, big silver charms and pretty textured fashion buttons will shine bright, highlighting your eye color and bringing your whole face alive. If you dress and accessorize to feel good and start to feel that way, opportunities will come your way. There is a benefit to keeping yourself and others around you in a good mood with jewelry. If you’re happy you stay healthier. Also people will feel more comfortable around you and be more likely to talk to you if you look like you’re friendly and open to them approaching you. Handmade Big Button Necklace shown above is designed for daring women. Colorful cool jewelry takes your bold style to the next level, so brighten up with this fun fashion accessory and bring extra dimension to your wardrobe. Shiny beads move freely on big silver loops that connect big teal buttons in unique design. Pink Diva Necklace shown on the right has plunging double layers of eye catching buttons in shades of divine light and dark pink. Fun buttons are handpicked and long silver loops link detailed buttons in pendant style drop. This fashion accessory adds fun to any ensemble. Buying original jewelry designs is about adding to your fashion style with unique earrings, bracelets and necklaces to show you’re smart, bold and intriguing. Handmade designer fashion jewelry adds layers of interest to your style to make you stand out, because it’s not only what you say, but the impression you give that gets you noticed. Look for jewelry that has variations in style and color from the jewelry you already have, don’t buy more of the same. We’ve all made that mistake, because we feel secure in buying what we know. The problem is you end up with multiples pairs of earrings, and a tangle of bracelets and necklaces that look the same. Meanwhile you keep wearing only one favorite jewelry piece over and over again. So step off the edge and plunge into the unknown world of artistic original jewelry designs. Find jewelry that is made with unusual beads, cute charms, or pretty accent findings that make it stand out. If each bracelet or necklace you buy is unique from the next in style and color you will be more satisfied with your purchases. Ofcourse they should all look spectacular on you, or put them back. Also make sure your jewelry is unique from any current trend. If it’s something that you will give away next year, because it looks dated then it wasn’t a good buy. If you have a few pieces like that already you can update them with a creative afternoon of do it yourself jewelry redesigning. Glam Flower Earrings shown above have fire polished czech beads hanging from glamorous gold flower buttons. Bold, fun earring details make your fashion style shine. These make great wedding, christmas or special occasion earrings. A must have accessory for a gorgeous in demand fashion diva. Drop Dead Fashion Earrings shown above are long drop dangle earrings made with small and medium size fashion buttons hanging from glamorous large beads. You’ll look gorgeous wearing stunning unique earrings that no one else has. I love unique handmade jewelry. Big bold earrings that make you smile, cute bracelets that shimmers when you move, or pretty necklaces you can’t stop admiring. Below are many fun reasons to love original colorful jewelry. You can spend all day looking at the beads and fun charms hanging off your new bracelet. With all sorts of different shapes and textures you can’t stop admiring it. Friends and coworkers compliment you on how amazing you look when you wear your favorite jewelry. You just shine. You feel bolder wearing big earrings and a fun statement necklace, it adds to your confidence. You know you can get through anything today. You just can never have enough sparkling jewelry and it’s so easy to trade accessories with a friend. It’s great fun to make jewelry too. You can collect pretty beads, puppy charms and ladybug buttons that nobody else has to make something uniquely you. Fun unusual accessories can make an old outfit seem new again. Original jewelry highlights who you are, fun, young and on top of your game. No one can forget who you are anymore. Your one-of-a kind jewelry doesn’t have to be expensive to look expensive. Unique bracelets, bold necklaces and fun earrings inspires your creativity when you wear them. Necklaces, bracelets and earrings are great gifts for friends. It’s shiny and bright, and your friends are happy to receive it. The Glam Flower Earrings shown above are actually lightweight, so no sore ears here. 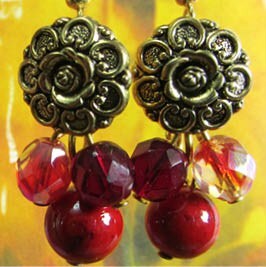 Earrings have shiny red czech beads and swirl glass beads hanging from flower buttons. This bold, fun must have fashion accessory makes your style shine bright. Great wedding, christmas or special occasion earrings. Vintage Style Glam Bracelet shown above has clusters of shiny beads and glamorous vintage style buttons in smoldering retro hollywood design. Unique jewelry for a unique woman. Bring fabulous back to your look with chunky chic fashion jewelry and prepare for an influx of admirers. Beautiful handmade Princess Necklace on the right casts a spell with pretty pink buttons hanging from elegant double strands of silver colored oval chain. Regal multi strand necklace uses colorful handpicked fashion buttons with interesting shapes and detail. Unusual jewelry design is perfect for weddings, parties and romantic evenings. I love wearing my handmade jewelry out. Whenever I step out of my house, it’s a chance to show off my newest trendy bracelets, colourful earrings and flirty fun necklaces. I get great compliments and feedback on my original designs. I make new jewelry designs every few weeks. Then when I meet a sister or a friend at a coffee shop, I bring my new earring, bracelet and necklace designs along. Often friendly strangers will come up and want to see my bold bead and button jewelry too. I ask them what colours and styles they like best and if they want to try something on! My sisters are also great supporters of my unique jewelry and will wear my jewelry designs whenever they can. I sold 15 pairs of earrings to a neighbour after one sister wore my earrings at a street sale. Another sister showed a pair of earrings I made for our niece to co-workers and her co-workers bought some of my jewelry too. Last week I had a green pair of Big Button Fashion Earrings in my jewelry post, Jewelry Gifts for Cool Sisters and Bestfriends. This week I have 2 more pairs to show. These earrings have big buttons hanging from fun small buttons in unique design. Colourful cute details make these earrings fabulous for all daring women. Do you make wearable crafts? Wear it whenever you can and ask your friends and family to do the same. Their excitement and support for you can be contagious. When jewelry shopping for your super bestfriend or cool sister, the gifts to look for are handmade and one of a kind accessories they can’t find anywhere else. Buy that long dazzling pair of earrings, the cute charm bracelet, or the glamorous necklace you know will look great on them, but they won’t buy for themselves. You can find fun chic handmade jewelry designed by talented artists at reasonable prices. If you see a beaded bracelet created with all the colours your bestfriend loves, or a long pair of earrings made just like your quirky sister would wear, be spontaneous and buy them. Jewelry can be a fun pick me up and a bestfriend, or sister will always appreciate your thoughtful gift and someday return the favour. Friends and sisters are with us through all of life’s ups and downs, so don’t wait for a special occasion like birthdays or christmas to surprise them with a fabulous bracelet or elegant necklace. Beautiful handmade Princess Necklace shown above casts a spell with pretty pink buttons hanging from elegant double strands of oval silver chain. Unusual jewelry design is perfect for weddings, parties and romantic evenings. This Hollywood Glam Bracelet shown above is designed with ornate gold and black buttons with faceted czech beads in striking shades of green, blue and teal. Bracelet has glamorous vintage look perfect for fashion divas making a dramatic entrance. Big Button Fashion Earrings shown on the left have big buttons hanging from fun small buttons in unique design. Colourful cute details make these earrings fabulous for all daring women and are a must have fashion accessory for trendsetting fashion stars. Read Making Jewelry for Family and Friends Turns Addictive, if you would like to take the next step and make jewelry for the people you love. With fun jewelry your style can have humour and still be fashionable. If you’ve taken your style too seriously in the past, try fun accessories for a change and fashion will be your happy friend for life. Experiment with wearing cheeky fun earrings, bold charm bracelets and big colourful necklaces and give yourself and everyone around you a cheerful lift. People communicate many things without words so you can use your new fun with jewelry attitude to make yourself more memorable and approachable. Now when you walk into a room wearing your fun fashionable jewelry, people will notice you and your friends will be crazy for your cute earrings, your charming bracelet, or that bold necklace you wear so brilliantly. When I make my original jewelry designs I think who doesn’t like oversized ladybugs on a bracelet, big seashells on a necklace and little dog charms on earrings. How about a bracelet made with yellow hearts, or a necklace with cute flower buttons in shades of purple and lavender. So when I realized that these Glam Flower Earrings shown above were starting to look like flowers and leaves sprouting from a pot I knew I was on to something. I wasn’t necessarily trying to make flower earrings, but I love it when inspiration leads you down a whismical path. These earrings look vintage with several czech beads hanging from glamorous buttons. Great wedding, christmas or special occasion earrings. These Cheeky Charm Earrings shown on the right really stand out, because I use big charms, if they were smaller it would seem delicate, but these oversized charms says, "Notice me and smile!" Being subtle was never my style. So get fabulous compliments wearing these cute double button and silver charm earrings. I make these earrings with pretty butterfly, star, flower, fish and leaf charms. At first I made jewelry as gifts for my friends and family to save money, but now each birthday gives me a chance to try something new and fun. Luckily my sisters, nieces and friends are happy to receive my experiments in original bead and button jewelry. If you want to make jewelry for friends and family, plan to make more than one of any earring, bracelet or necklace style you create. So if for example you’re making earrings, once you’ve figured out the design of the first pair, the next pair you make will go much faster. There is also a cost savings to making multiples of your jewelry creations. Since beads, charms, clasps, and eye pins are usually sold in packages of 25, 50 or more, you can use up the excess materials just by making more jewelry. Beware jewelry making is addictive. Once you’ve made a few really pretty pairs of earrings, or a small collection Diva worthy necklaces, you just want to make more. But this creative affliction to constantly make more jewelry can be a good thing, especially when one sister wants the bracelet you just gave to another sister. Now here within your own family you’ve found your first customer and all of a sudden you’re a jewelry designer with a small business. Button Girl Earrings shown at the top right are a cute fashion accessory for girls and women. These flattering drop dangle earrings pair bright and fun button shapes together. These earrings were made for my sister Martina’s birthday. Sassy button details and bold dramatic colors are combined with fashion flare to make these cute dangle earrings perfect for her. Large Flirty Charm Earrings shown above and to the left, with silver pewter dog charms hanging over big fashion buttons were made for my niece’s birthday. I knew they would be perfect for her, because she loves anything with puppies on it. Also shown above and to the left are the same style of earrings with cute butterflies charms. I keep seeing more charms I just have to have. Can your fashion style stand to be more adventurous? Jewelry can be an important part of any fashion makeover. Set the tone for how you want to be treated with how you dress and accessorize. Great things happen to those who aren’t afraid to be noticed. So dress to get the job you know you already deserve by accessorizing with a glamorous take-charge necklace, then wear fabulous long earrings on your fun night out and gather many admirers. It doesn’t take much to make a positive change, and that’s where jewelry comes in. Show your individuality and creativity by spicing up your style with one of a kind jewelry pieces. Accessorizing with dazzling drop earrings, charming beaded bracelets and dramatic layered necklaces expands your wardrobe and makes it seem like you have an endless amount of clothes in your closet. Everybody likes to work with people who are positive and up for any challenge. Wear this fun sophisticated one of a kind Purple Glam Necklace shown above with your business attire and be professional, dynamic and inspiring. These striking Big Button Earrings shown above on the right will compliment your fun flirty date night dress to give you the confidence to shine and bring your social life to life. You can’t go wrong wearing this lush Lucky Charm Bracelet with your casual attire, shown here on the right. Being casual and comfortable doesn’t mean you can’t look super fantastic too. Are you afraid to stand out?